In their typical process, Total receives pressure data from affiliates, but in a variety of formats. Using that data to gain valuable insights has traditionally been a challenge; it requires manipulating multiple files and working with complex Excel formulas, which is time-consuming and error-prone. Total needed an easy-to-use pressure data warehouse that would allow users to view and use pressure data for projects such as basin scale exploration, prospect evaluation, and reservoir model construction. 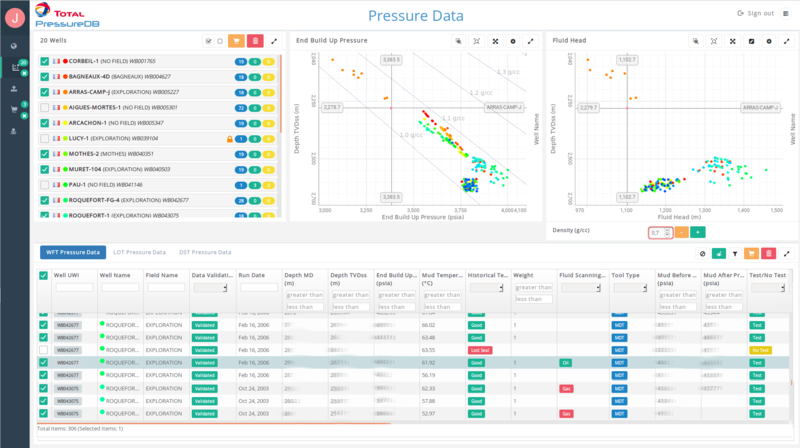 Total worked with INT to create PressureDB, a robust web application designed to allow users to access and analyze pressure data through a friendly web interface. Pressure data is imported based on Excel templates (WFT, LOT, and DST) or XML files (COP TOOL box), and wells’ general information is issued from the Total in-house well database. Data import workflow allows users to perform assisted QC on pressure information and associated metadata. Once the data is imported, users can compare multiple wells’ pressure data quickly and accurately, saving time and reducing errors. PressureDB keeps data confidential and secure using the Total SSO mechanism. Data can be accessed according to user profile types either at the well or pressure data level. A powerful user management interface allows managers or admins to add or change user levels, region, and permissions as needed. The map search functionality allows both spatial and text search, with multiple selections possible. Users can load searched data and view formation pressure and fluid head quickly. Built using an NGINX web server for static content, reverse proxy and SSL, AngularJS for application code, INT GeoToolkit.JS for data visualization, and Bootstrap Admin template for the web site design, the backend uses Node.js to manage requests and communicate with the database servers.